Adamantite, Electrum, and Orichalcum are synthesis materials in Kingdom Hearts 3. You need these synthesis materials to craft all kings of useful items. Of course, finding these materials aren’t exactly always easy. Plus, sometimes you just want the ability to grind the materials out in one place, instead of looking into every nook and cranny. If that’s your line of thought, this is the place for you. Our Kingdom Hearts 3 Where to Get Adamantite, Electrum & Orichalcum guide will show you where you can farm these synthesis materials in one place. Where to Farm Orichalcum, Adamantite & Electrum in Kingdom Hearts 3? 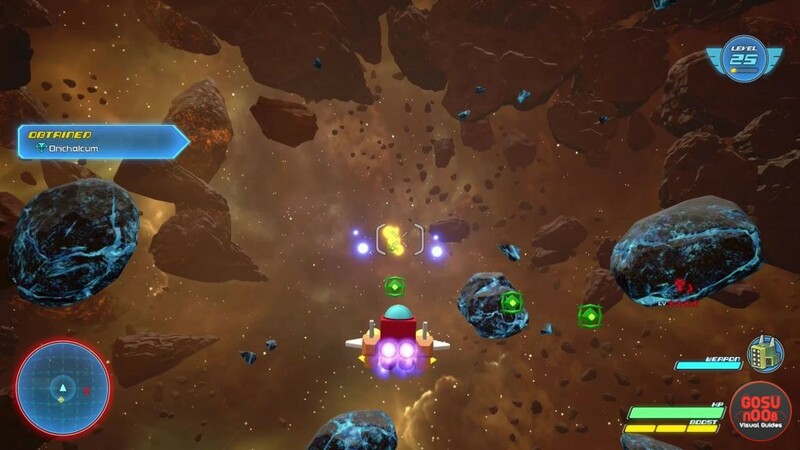 To farm Adamantite, Orichalcum, and Electrum in Kingdom Hearts 3, you’re gonna have to ride through space in your Gummiship. Now, of course, you can always head out there and search the dozens upon dozens upon dozens of chests that are in the game. However, if you want to farm some extra materials, space is where you need to go. Of course, not any darned ol’ corner of the cosmos is going to do. No, you first have to go to The Eclipse on the World Map screen. From there, scroll over to the Keyblade Graveyard in the World Map screen. Then, hit the button for Embark from Here (it’s Triangle on PlayStation 4). After a brief cutscene, the game will shoot you towards a huge, black-and-red space station. Hang a right as soon as you get control over the ship. In the distance, you’ll notice a sort of asteroid field, made up of large, blue-glowing rocks just a-floatin’. What you have to do now is shoot them all, and I do mean all of them. Each rock you shoot has a chance to get you something good, including Mythril, Adamantite, Electrum and Orichalcum; and even Damascus, if you’re lucky. Now, the fact does remain that you won’t really walk away with too much extra materials. You might get, like, two or three of each; sometimes only one. Fortunately, though, you can always come back here, and the asteroid field will come back. So, you can keep forming as long as you want, or need to. And, that’s about it. If you need help with anything else, please check out some of our other guides, including Miller Mushroom Location and Constellation Locations – Stargazer Trophy, among many others. Or, for another location that’ll get you some good materials for little effort, here’s our Rare Synthesis Materials Secret Cave Location guide (thank you to our reader BlackStar for pointing it out). In Caribbean world On the island of sandbar isle up at the high mini forest rock there is a big hole you can jump in that leads to a under water cave full of chests around 6 of them all containing super rare materials.